AColonialHeights day care that has operated for nearly four decades closes today, leaving families scrambling for alternatives. In a letter dated Feb. 4 — a week before closing — MountPleasantBaptistChurch informed parents that it will discontinue operations at its day care facility, citing operating costs and licensure requirements. 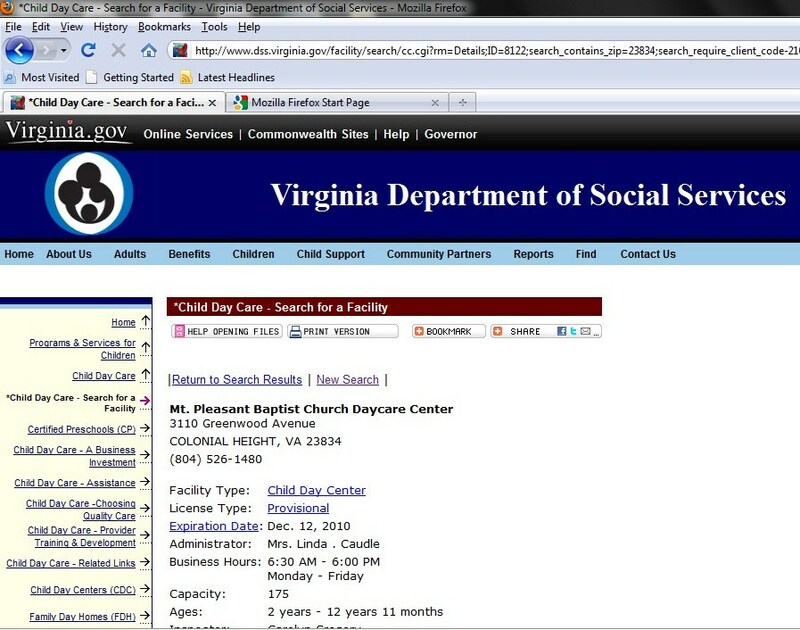 The day care, which opened 39 years ago, had been operating under a six-month provisional license from the VirginiaDepartment of Social Services that expired Dec. 12. A Social Services inspection Jan. 10 found repeated violations related to staff records that required the development of an "intensive plan of correction" to ensure future compliance. The inspection also found the amount of resilient material in fall zones around playground equipment and swings was less than required. Mount Pleasant has a variance that permits 4 inches of shredded rubber, but the inspection found a depth of 2 inches. "They basically set in motion some deadlines for us to make some massive overhaul changes. . . . We just didn't feel like we were going to get those changes done in that timeline," said the Rev.Curtis Barnes, senior pastor at MountPleasant. The deadline to implement those changes was today, Barnes said. He also noted that MountPleasantBaptistChurch had a $300,000 reduction in operating expenses this year that played a role in the closure. The day care's operating costs are about $540,000 a year. LindaCaudle, the program director at MountPleasantBaptistChurchDaycare Center, said the staff could have turned things around if given more time. "Everything was something we as a day care felt could be taken care of with a little bit more time," she said. "One week did not give us the time we needed." There are 125 students enrolled in the day care, with a capacity to serve 175. The day care has 30 staff members. The closure came as a surprise to parents. "It hit all of us very abruptly; it's a big shock," said DawnAtkins, whose 4-year old son is enrolled at Mount Pleasant. "After he's formed relationships with the teachers, the kids, now they are all being ripped apart." ElaineNance has two great-grandchildren enrolled at MountPleasant and was critical of the church's decision. "The manner in which this was handled, the short notice given to all the parents, as well as to all the affected staff . . . is not endearing this church to the community," Nance said. Barnes said the week's notice was given to parents on a recommendation from Social Services. "We're grieving. It's a terrible loss; we hate it," Barnes said. "We have a group of people who worked diligently to do all they could to try and keep it open." Child-care facilities in the Tri-Cities region are rallying to help parents affected by the closure. Atkins has enrolled her son at Ivey MemorialChildDevelopment Center in Colonial Heights. The STANDSchool in PrinceGeorge, a Christian day care that opened in October, has room to take an additional 30 students, including about 10 in the potty-training class, its director said Thursday. "It's important to us that kids who are already having seeds of faith planted at their current preschool . . . move to a school where that will continue," said PamSheeder, director of The STANDSchool. Description: Based on review of seven staff files on 1/10/11 documentation was not available that staff met qualifications for lead teacher. Findings: Records for staff # 4,5, and 7 did not contain verification of educational background. : Per director: Each staff person was interviewed and were told to bring in immediately. Center will be required to complete an Intensive Plan of Correction. All required documents to include evacuation plans, menus, daily schedule, license, and most recent inspection results were posted. Required emergency supplies and equipment were in place. Seasonal artwork was on display throughout the facility. Previous violations related to references for staff and trip hazards have been corrected. Repeat violations related to staff records will require the development of an Intensive Plan of Correction that addresses correction of the violations and development of systems to ensure future compliance. The licensing inspector will contact the program director to set up a time for conference with the Licensing 'administrator. Description: Based on review of staff files on 8/31/10, documentation was not available that there was always a staff person who met program leader qualifications in preschool classrooms. REPEAT VIOLATION. : Beginning the week of 9/6/10, all staff working either a.m. or p.m schedules, had to meet the minimum qualifications for leadership in a classroom. We understand that the minimum would be a high school graduate or equivalent, at least 18 years of age and have six (6) months of supervised classroom experience or training. All of our teachers meet and most exceed this minimum standard. We do have aides in one (1) class only, which are the 24 month olds who are non-potty trained. The teacher to child ratio is 8 to 1 however, we do have an aide in the morning and the afternoon working completely under the leadership of a lead teacher and in no way take on the role of the lead. They are in the room strictly to help the teacher due to the needs of this age group. Description: Documentation was not available that there was always a staff person who met program leader qualifications in preschool classrooms in the afternoon. experience in child care, but in different areas. We have been able to switch the teachers around during nap time and for the rest of the afternoon. 24 months old - Dragonflies has a lead teacher and one aid for about 11 children. 2's & younger 3's - Butterflies & Crickets have a lead teacher and one aid for about 15 children. Older 3's - Ladybugs & Guppies have a lead teacher and one aid for about 18 children. 4's - Busy Bees, Honeybees and Sunbeams have one lead teacher and two aids for about 25 children. Fireflies do not meet during the summer. By the end of the summer the aids will have 6 mo. of experience.